Pink Lemonade: There are only 16 days left until Halloween! Quick! 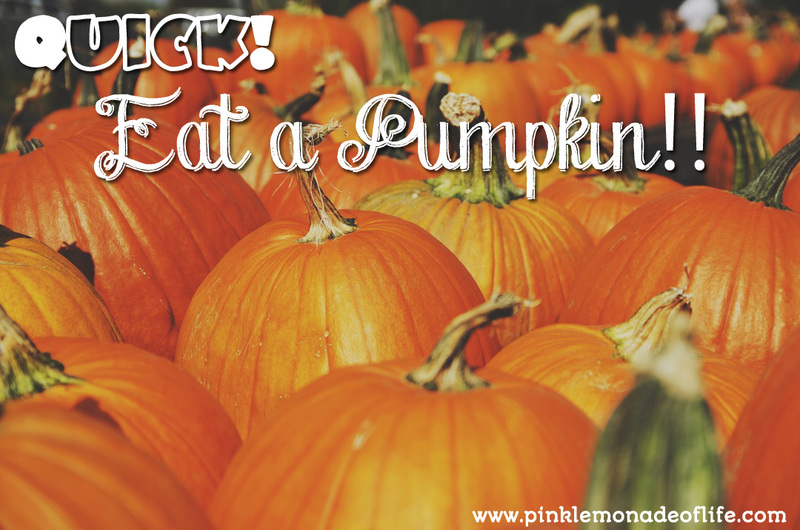 Eat a Pumpkin! There are only 16 days left until Halloween! Quick! 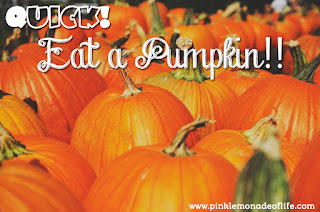 Eat a Pumpkin! In honor of National Pasta Day on October 17th, the folks at Omega Juicers have provided a few “not-so-ordinary” pumpkin recipes for you to try at home. Celebrate National Pasta Day AND pumpkin eating season with Pumpkin Mac and Cheese and Pumpkin Raviolis. Enjoy! Cook pasta in boiling salted water until al dente. Drain and rinse with cold water. Set aside. In a heavy saucepot over medium high heat, melt the butter and add the flour. Whisk together and cook for thirty seconds. Add 2 cups milk, minced rosemary, and thyme and whisk until smooth. Add another cup of the milk (reserving one cup) and continue to whisk. Cook for approximately 5 minutes while whisking. The mixture will begin to get very thick! Add the cheese and stir well so that the cheese melts evenly. Add the salt, pepper and cayenne followed by the additional cup of milk and the pumpkin puree. 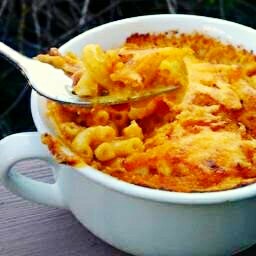 Once everything is smooth, add the cooked macaroni and toss to coat. Pour into a 9x13 casserole pan and top with breadcrumbs. Place 2-1/2 cups flour in a large bowl; make a well in the center. Beat eggs and oil; pour into well. Stir together, forming a ball. Turn onto a floured surface; knead until smooth and elastic, about 8-10 minutes, adding remaining flour if necessary to keep dough from sticking. Cover and let rest for 30-45 minutes. Meanwhile, in a large skillet, sauté pumpkin and shallot in butter until tender. Add the sage, thyme, salt and pepper. Transfer to a food processor; cover and process until blended (or use an immersion blender right in the pot to process until smooth). Return to the pan and stir in cream. Bring to a boil, stirring constantly. Reduce heat; simmer, uncovered, for 15-20 minutes or until thickened. Sprinkle work surface with semolina flour. Divide pasta dough into fourths; roll one portion to 1/16-in. thickness. (Keep remaining dough covered until ready to use.) Working quickly, place rounded teaspoonfuls of filling 1 in. apart over half of pasta sheet. Brush around filling with egg. Fold sheet over; press down to seal. 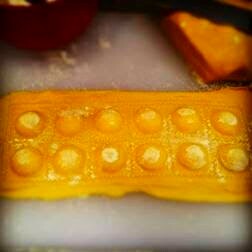 Cut into squares with a pastry wheel or ravioli stamp cutter. Repeat with remaining dough and filling. This can also be don’t with a pasta maker and ravioli molds which are available in most home specialty and department stores. Bring a large stock pot of salted water to a boil. Add ravioli. Reduce heat to a gentle simmer; cook for 1-2 minutes or until ravioli float to the top and are tender. Drain and keep warm. In a small saucepan, cook butter until brown “bits” begin to form, approximately 5 minutes on medium heat. Remove from heat and stir in thyme, rosemary, and salt and pepper to taste. Pour over ravioli and toss to coat.